After living in Orlando my entire adult life, I have played my fair share of mini golf courses. Most of them seem to blend together with Pirate or Jungle themes. Drive about 10 minutes in any direction between International Drive and Highway 192 and you’re bound to pass at least three or four generic looking putt putt courses. 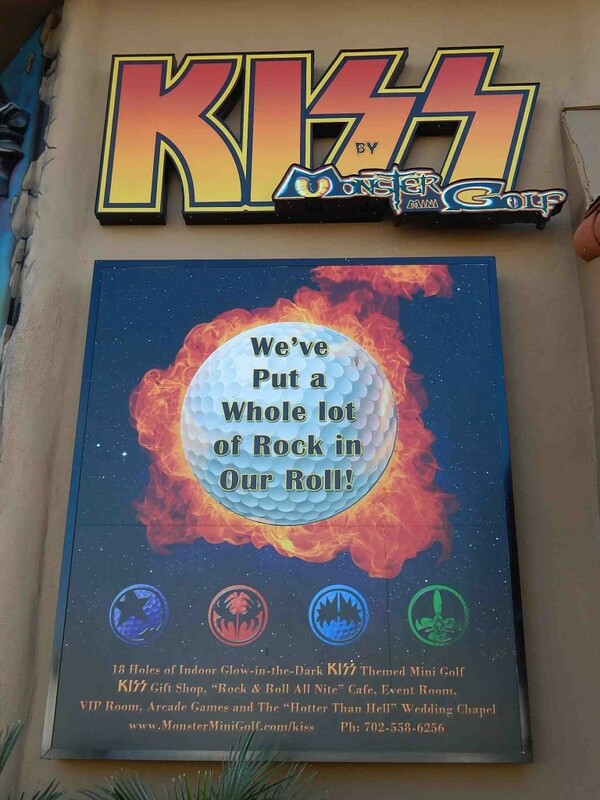 Searching for an original theme on my recent trip to Las Vegas, I decided to stop by KISS Monster Mini Golf in Las Vegas located directly across the street from the Hard Rock Hotel and Casino, where I happened to be staying. Like anything KISS does, the 18-hole course is over-the-top in just about every aspect. Glow-in-the-dark mini golf courses have been around for over 10 years now, but most have themes of generic spooky forests or jungles. 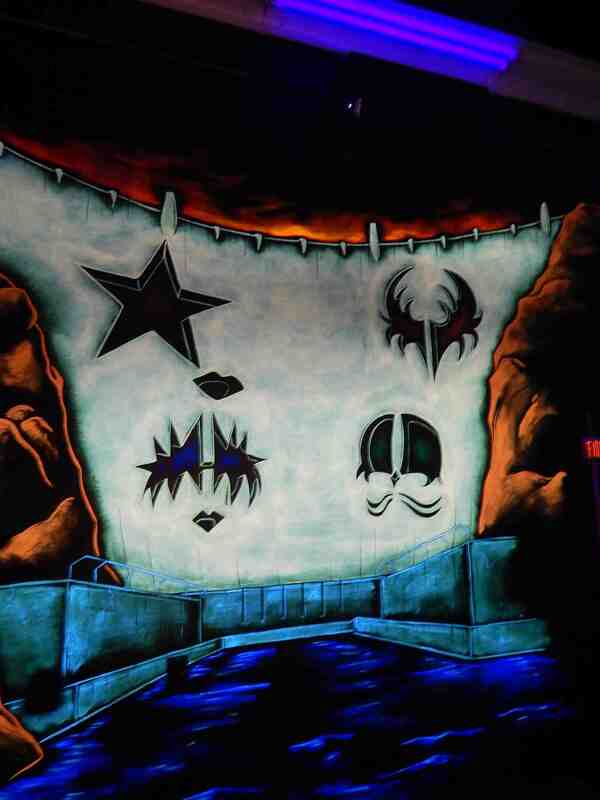 KISS Mini Golf also used black light, but it feels more like a concert setting. 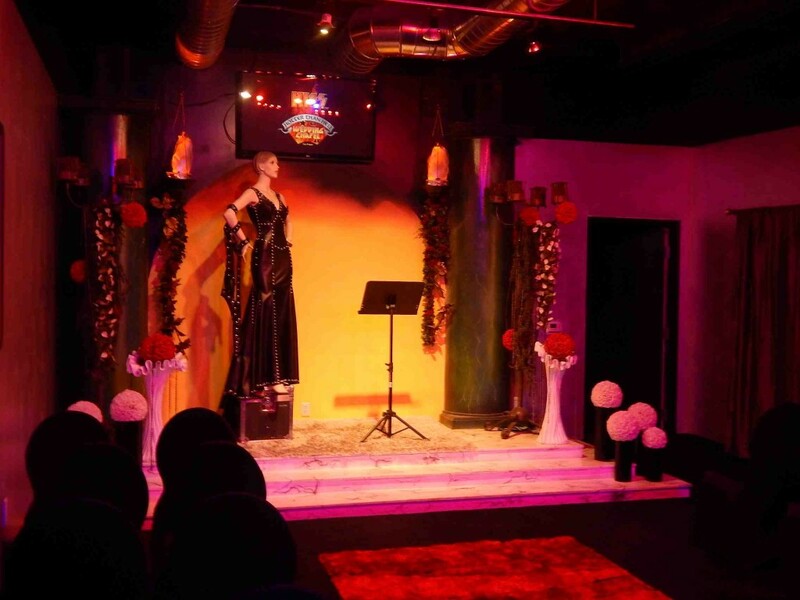 Fog machines, strobe lights and even lasers are used to heighten the experience. Around the outer walls of the course, there are various scenes where the band has clearly taken over Las Vegas iconic celebrities and landmarks, like the Hoover Dam seen above. Needless to say, the soundtrack is nothing but KISS music, from classics like “Rock N’ Roll All Nite” to some really obscure songs I have never even heard of. On select nights and weekends, there is a DJ in the booth who will take requests and even does KISS trivia for various prizes. 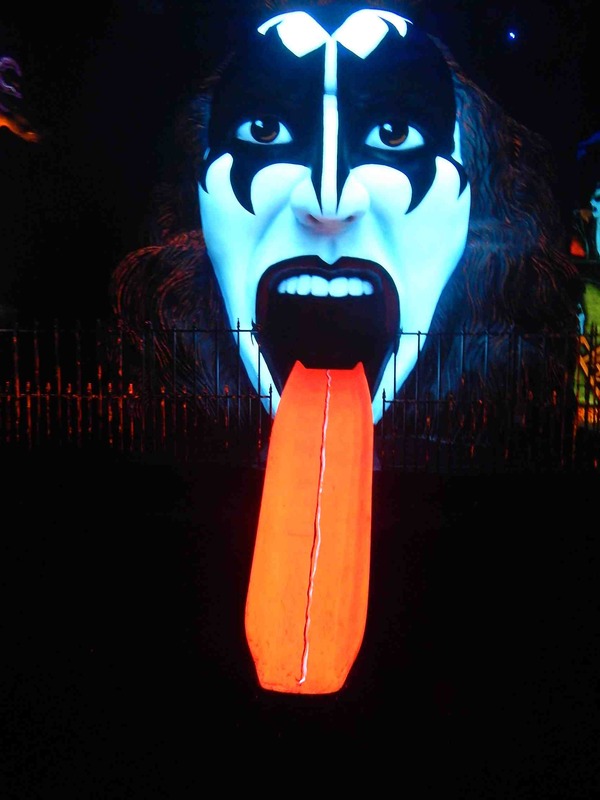 Ever wanted to put some balls directly into Gene Simmons’ mouth via his freakishly long tongue? In Las Vegas, your wish can come true. Nearly all the holes are themed to the band, their guitars or the band members themselves. 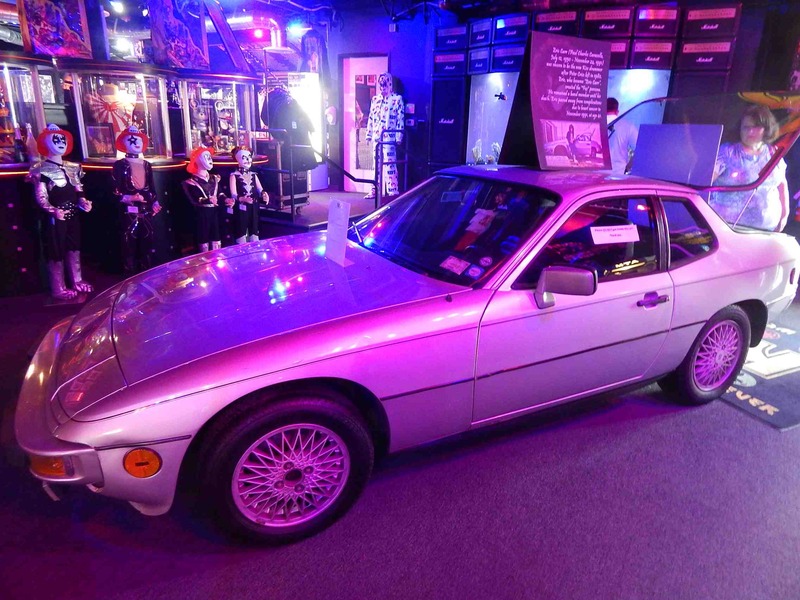 However, KISS Monster Mini Golf offers far more than just putting around. 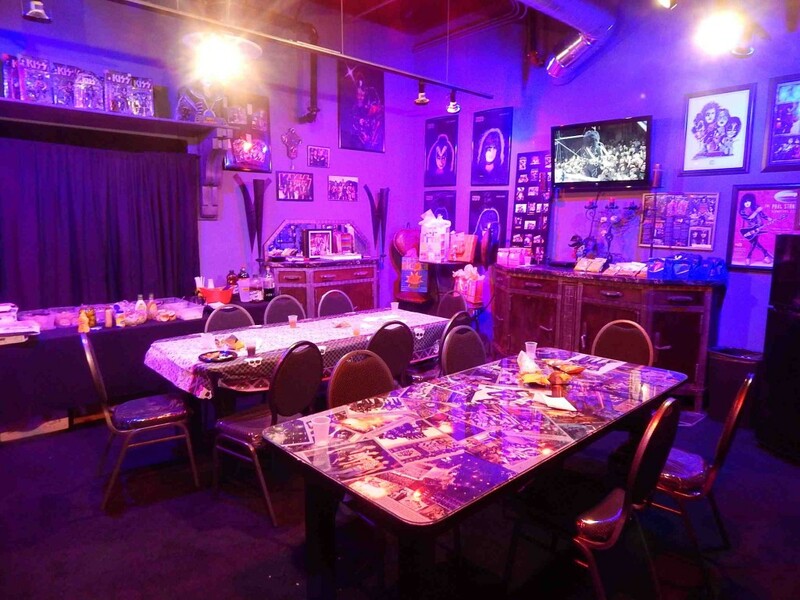 This VIP room is used for private functions and is filled with KISS memorabilia from concert posters to autographed guitars. It’s generally only used for special events and functions, but it’s a great place to kick back and relax on their oversized bean bag chairs. Naturally, they have a separate room for parties and events. On the day I happened to visit, there was a birthday party for a six-year-old boy. Even the party room is covered in KISS albums and has a TV playing concert footage. 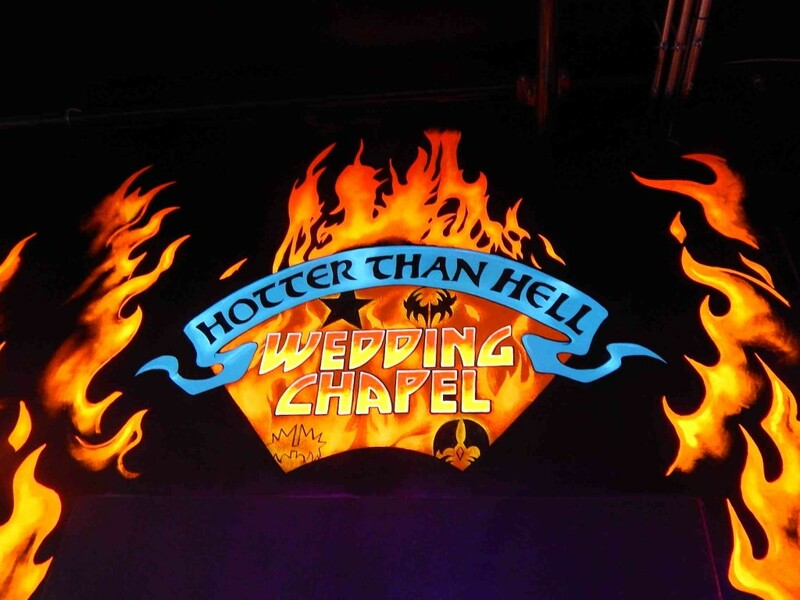 Las Vegas has always been known for shotgun weddings, but The Hotter Than Hell Wedding Chapel at KISS Mini Golf may be the most random place in town that couples can tie the knot. Sure, on the other side of this wall there are families putting golf balls through oversized guitars, but forget about that for a second. Hotter Than Hell can feature a wedding officiant dressed in a full KISS costume right down to the black and white face paint. If the bride and groom want to go for that too, have at it. It’s no secret that KISS hasn’t even come close to breaking any records when it comes to album sales. However, Gene Simmons has marketed the brand to the Nth degree. 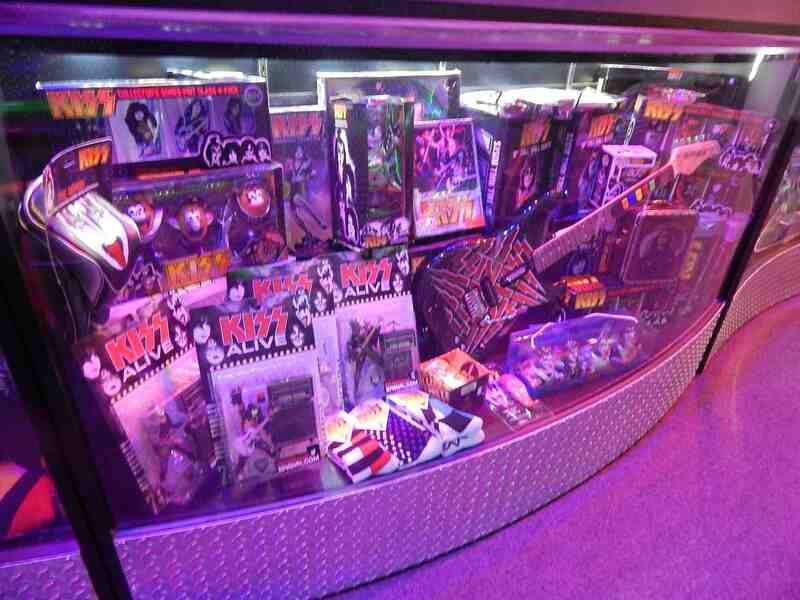 KISS Mini Golf features a wall of merchandise that has been sold by the band over the years, where true fans can fawn over action figures, lunch boxes and more. 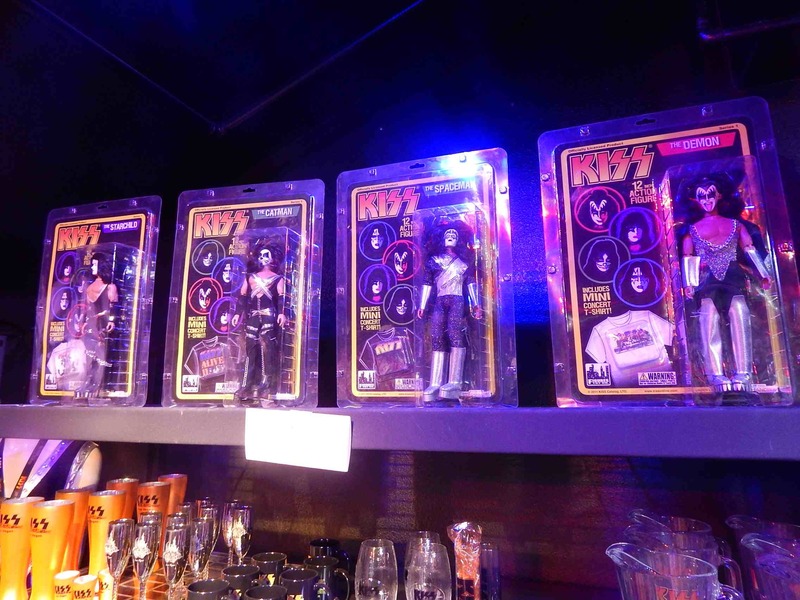 Naturally, there is a gift shop featuring a huge assortment of KISS merchandise that super fans will drool over… from these action figures…. …. to KISS Mr. 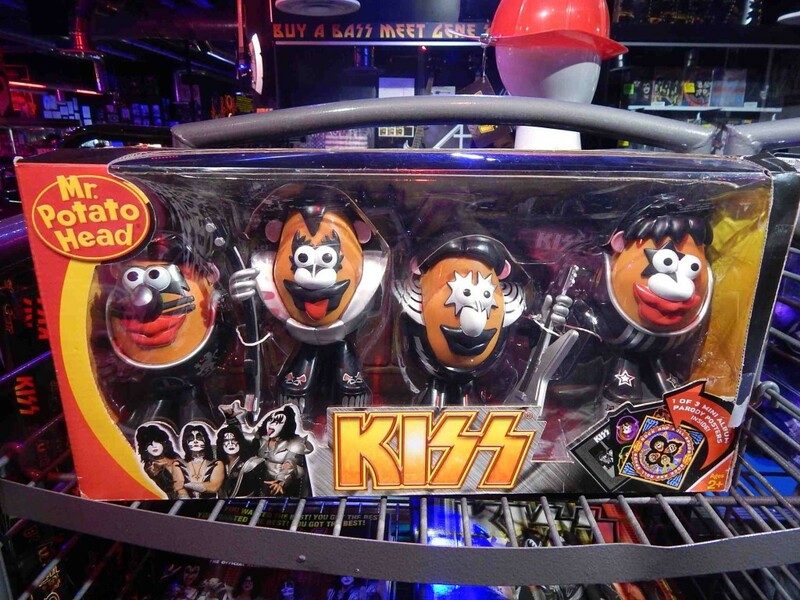 Potato Head figures. While I wouldn’t exactly call a full-on KISS band member costume an impulse buy, you certainly have that option as well if you are so inclined. 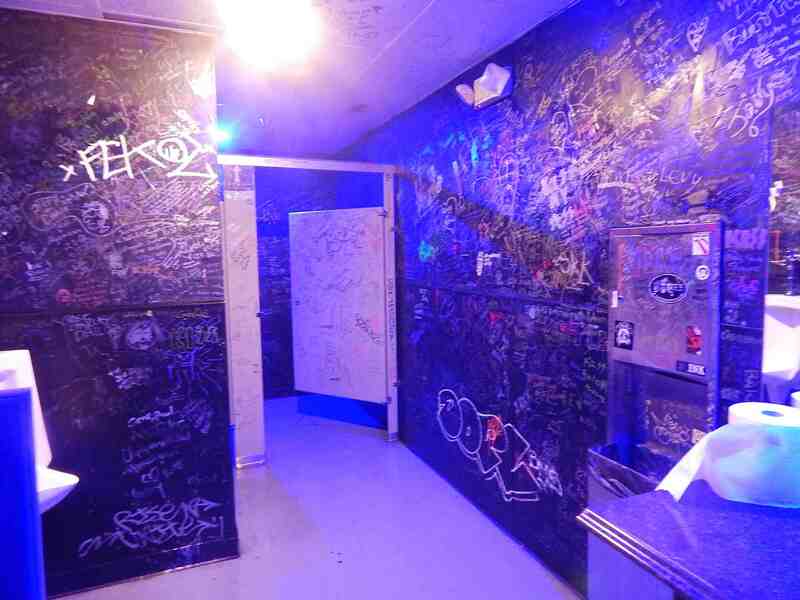 My favorite detail of KISS Mini Golf was by far the bathroom. 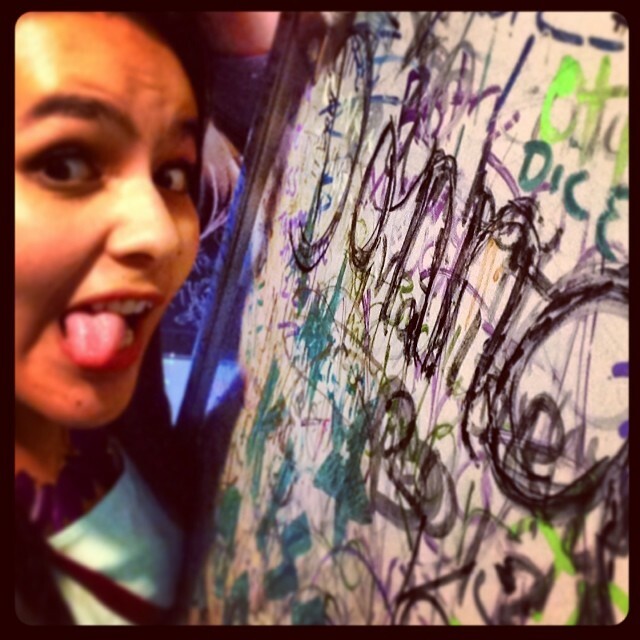 In true rock star style, they encourage to leave your mark all over the restrooms. Didn’t bring a Sharpie? No problem. Just ask one of the attendants behind the counter and they will loan you one, for the sole purpose of inking up their bathroom walls. How many places are just cool with that? 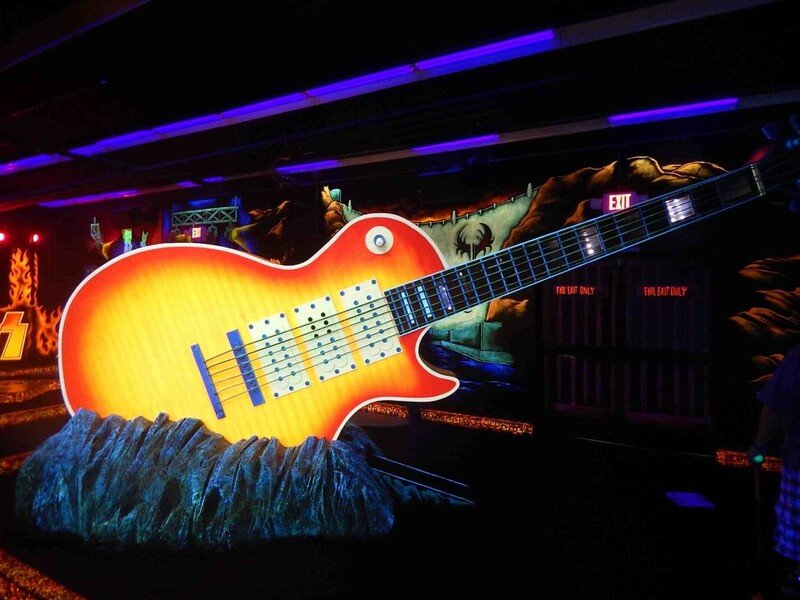 Next time you are in Vegas and are looking for a family friendly attraction that is completely unique, drop by KISS Monster Mini Golf right across from the Hard Rock Hotel. 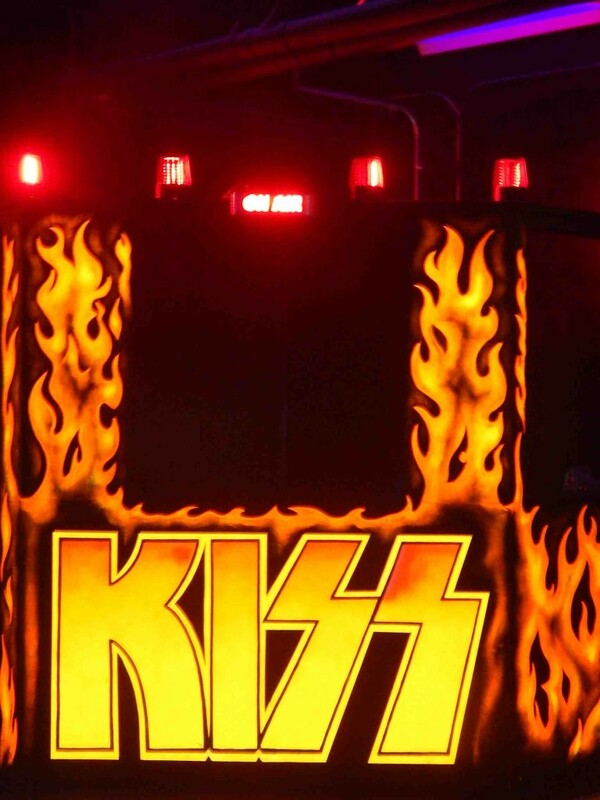 For more information visit www.monsterminigolf.com/Kiss. Make sure and take the time to follow @TPUJosh on Twitter by clicking this link and like our Facebook Page by clicking here! 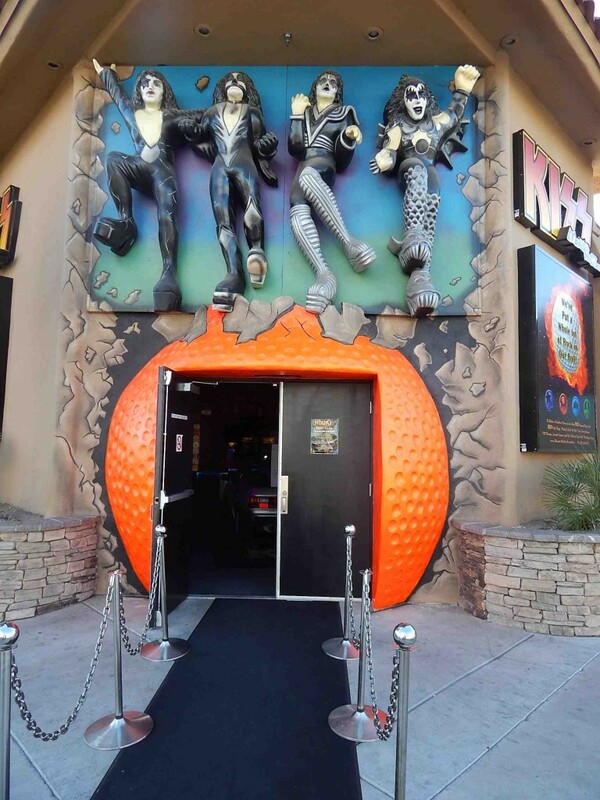 This entry was posted in Attractions, Outside The Parks and tagged Hotter than hell wedding chapel, KISS birthday party, KISS Las Vegas, KISS Merchandise, KISS Mini Golf, KISS Monster Mini Golf, las vegas attractions. Bookmark the permalink. Trackbacks are closed, but you can post a comment.